Arkansas' best family vacation spot is Bear Creek Log Cabins, just four minutes South of Buffalo National River Park on Hwy 65. Your complete outdoor adventure family retreat center. Children love hiking and hunting arrowheads on their own, while their parents just relax and enjoy the cool mountain scenery. 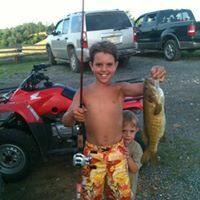 "The kids really enjoyed catching lots of fish in the creek and riding four-wheelers.Our trip was even more enjoyable because of your friendly hospitality..."
Folks who just like to wander and roam, enjoy finding their own way around our fields, creek banks, mountains, and woods. 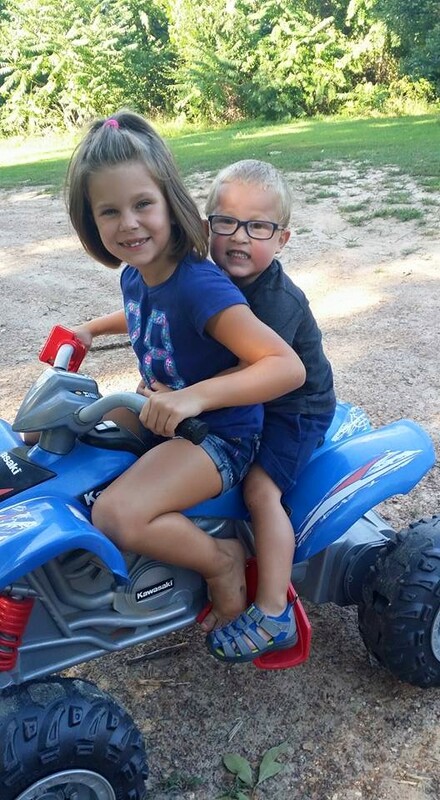 "The boys have had a great time 4 wheeler riding, hunting tadpoles and arrowheads, skinnying dipping in the creek, and just being able to roam..."
CONTACT US about a log cabin rental for your next Arkansas family vacation. Canoeing on beautiful Bear Creek is available at NO CHARGE. Canoeing Outfitters are less than 5 minutes away where you can rent canoes for canoeing on the Buffalo River within the Buffalo National River National Park. Shuttles and guides are also available there for hire. Cool off with a swim in our year round creek. 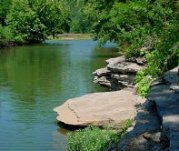 Or watch the turtles and small mouth bass or "brownies" swimming in Sally Hole, just upstream from the Buffalo National River. It's so private and secluded here, the kids and grandkids can do some good old-fashioned skinny-dippin' or just sunbathe on the beautiful rocks. Rafting Outfitters are less than 5 minutes away where you can rent rafts for rafting down the Buffalo River within the Buffalo National River National Park. Shuttles and guides are available there for hire. Private walking, hiking, photography walks, bird watching trips and nature hikes are natural pleasures for children and adults all around our cabins and along Bear Creek. 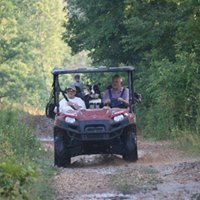 More serious hikers will enjoy the world famous Ozark Highlands Trail. 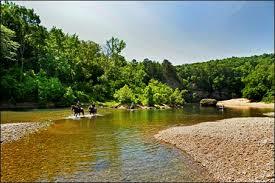 Four beautiful access points to this scenic Ozarks hiking trail are close by. Buffalo River National Park's Tyler Bend Visitor Center is just a few minutes away. Many easy public hiking trails and picnic areas are available there. Little Heaven Ranch offers family friendly horseback trailrides and lessons just a short scenic drive from your cabin. Also horseback rides of 30 min, 1 hr, 2 hours, half day, or full day along the Buffalo River can be arranged for an outfitters fee just a few minutes North along Hwy 65. Our spectacular wilderness views make mountain bicycle trail riding especially enjoyable in any direction from our cabins. Mountain bike rentals are also available just a few minutes away. Many mountain bikers get in shape along the first American National River Trail located inside the Buffalo River National Park. As you explore our beautiful bluffs and open areas, you can hunt for arrowheads on your own. The Ozarks bluff dwellers of prehistory left lots of hunting arrow points along the creeks that flow into the Buffalo River. You can imagine what it was like to live in an Indian village way back then. Be sure to bring your four wheelers! Our private farm and ranch roads are the perfect destination for your kids' atv trail adventures. 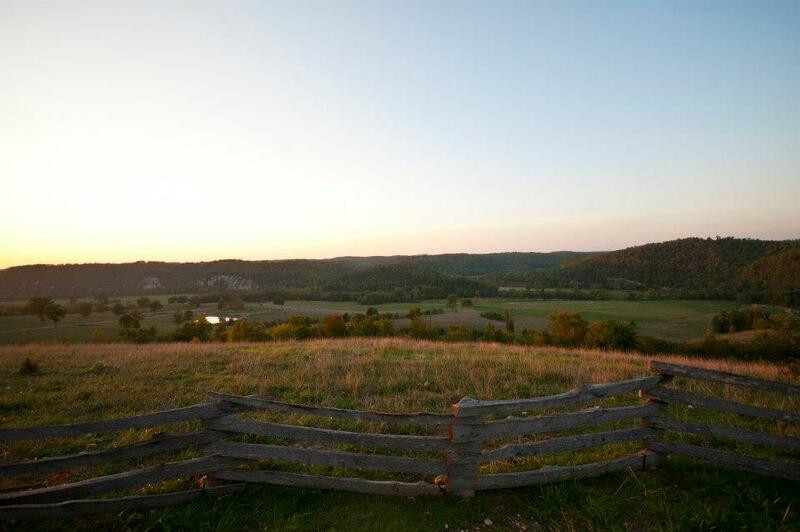 Our hills and mountains offer incredible views of the Bear Creek Valley, right in the heart of Buffalo River country. Our Fishing Holes along Bear Creek can't be beat for catching small mouth bass or brownies. 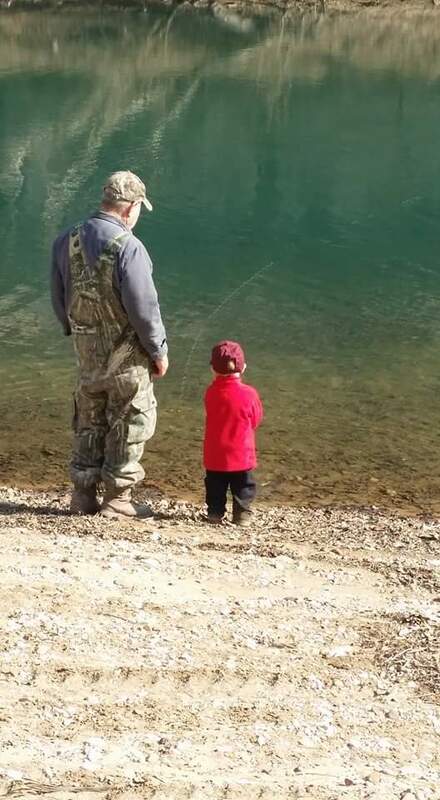 Or you can visit nearby Greers Ferry Lake or Bull Shoals lake for lake fishing. And don't forget the excitement of trout fishing and more on the White River, just a short drive away. Arrangements can be made to purchase an Arkansas Game and Fish fishing license when you arrive here for your family vacation. Our rolling hills are the best exercise running trails you'll find anywhere. So whether you just like to jog every day or you are getting in shape for a cross-country race or a marathon race or even a triathalon race; you can do some excellent training here. Just step outside your cabin and run in a completely safe and private atmosphere. Elk watching, birding, and all kinds of wildlife viewing is available from dawn to dusk for folks who like to get out and take nature walks. 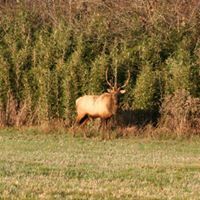 Hunting (including primitive sports like bow hunting and blackpowder hunting) on our PRIVATE 500 acre farm is available during Arkansas Game and Fish deer hunting and turkey hunting seasons at NO CHARGE. A valid Arkansas Hunting License is required, along with safe and legal hunting practices. Arrangements can be made to purchase a gun or archery hunting license upon your arrival for primitive or modern gun hunts. Whatever outdoor activities you like to do can be a fun part of your family vacation here at Bear Creek Log Cabins.